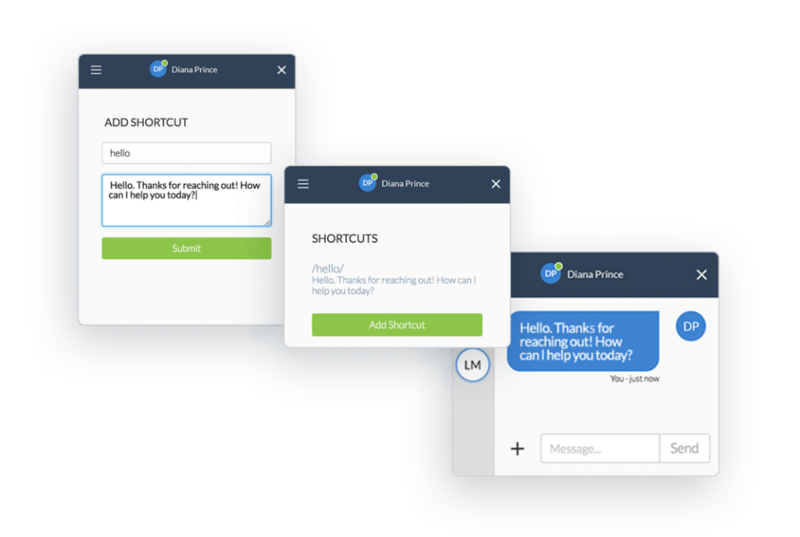 Live chat is a SaaS solution that enables website visitors to instant message back and forth with a business (usually a sales or support representative) on a company’s website. For the purposes of this article, we’ll discuss how live chat software is used by businesses to communicate with their customers. What is live chat and is it important for my business? The technology behind online chat has been around since the 1970’s, though it was not widely used until the late 1990’s. Since that time, it has become a staple in the way customers communicate with businesses online. A whopping 53% of customers would rather chat with a company than call. These customers prefer live chat for a variety of reasons. Some appreciate the ability to multi-task while chatting. Others feel live chat is quicker and more efficient than a phone call. When asked about using live chat versus email versus social media to contact a business, nearly half said they use live chat. Live chat isn’t likely to go away anytime soon. 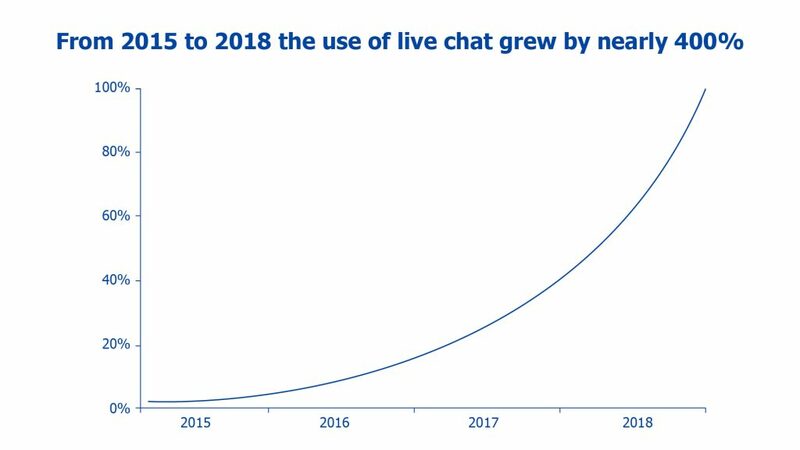 From 2015 to 2018 the use of live chat grew by nearly 400%. Read that again – 400%! This means your customers are using live chat with other businesses, and they want to use it with you too. It’s not just for customer support. Live chat can also change your approach to sales. 41% of customers said they trust a brand that offers live chat on their website. And this trust translates to sales – 51% of customers said they are more likely to purchase from a company that offers live chat. If that doesn’t convince you, consider this: 77% of customers said they wouldn’t purchase from a website with no live chat option. That’s a lot of lost sales. 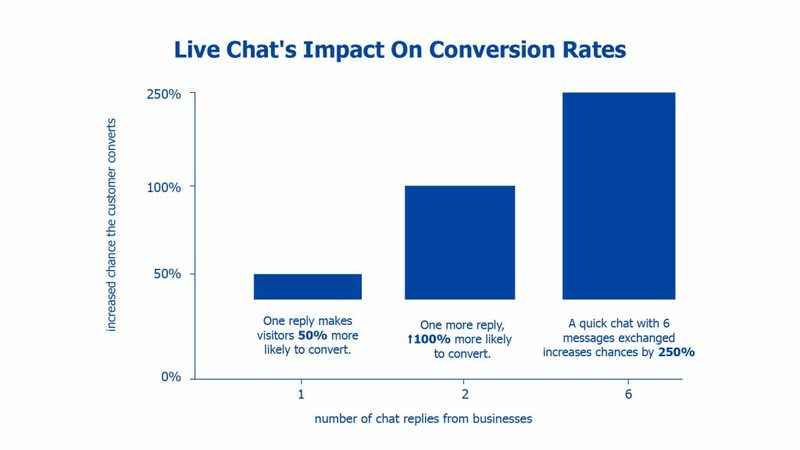 Statistics are great for proving the point, but let’s jump into the real benefits of live chat in your business. The list of benefits is long, but we’ve narrowed it down to our favorites. The old school way to provide customer support – by phone – is expensive. Depending on your company size and specific needs, it can be really expensive. 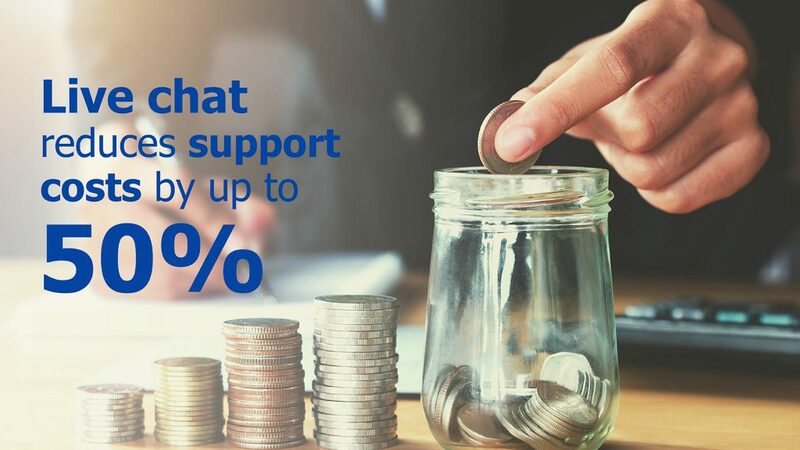 The use of live chat support can reduce these costs in a couple of ways. The most obvious savings come from equipment and support costs. Encouraging customers to use live chat support will cause a natural reduction in phone calls. Fewer phone calls require fewer phones, thereby trimming the cost of equipment and support. The often-underestimated savings with live chat is manpower and overall employee efficiency. A phone support agent can really only handle one phone call at a time. Compare that to live chat, where support agents can often handle multiple chats at once. Support calls sometimes require research or complex problem solving. In these cases, the customer may require a callback. The nature of the live chat environment makes it easy for agents to research or ask for help and resolve issues during the first contact. One study found live chat for sales had a 305% return on investment over a six-month period. That’s an impressive return considering most applications are relatively simple to install and easy to use. And that high rate of return doesn’t have to come along with a huge headache. Don’t forget the equipment and manpower savings we mentioned above. Those apply to your sales team, as well. In the same way a customer support agent can handle multiple chats at once, so can a sales rep.
For potential customers who don’t want to spend time on the phone or wait on an email back-and-forth, live chat is the best alternative. They’re connected to a live person but with the convenience of an electronic exchange. In fact, customers who are engaged via live chat are three times more likely to buy than those who are engaged through other communication channels. Consumers are incredulous by nature. Though people do a lot of shopping online these days, they’re still leery. Live chat takes a bit of the unknown out of the online experience. The mere site of a “chat with us now!” button takes the edge off, even if website visitors don’t need to chat with anyone at that moment. Giving your customers a quick and easy way to reach you will transform the loyalty they feel toward your brand. And reinforcing that loyalty with great service through live chat will seal the deal. Whether it’s a prospective customer or a repeat-buyer, the availability of live chat has been proven to increase the feeling of trust. In a traditional phone support setting, customers may be reluctant to share their pain points. Some customers don’t want to be perceived as a “problem child” or a complainer. Others may not be able to articulate their issues or feel put on the spot. And those who do voice concerns may not even be heard by anyone other than the person they’re speaking to. Live chat addresses all these scenarios. Customers will often find it easy to express their concerns or problems via live chat. Though it’s a personal interaction, it’s not face-to-face (or voice-to-voice), so some of the pressure is alleviated. Customers who may have difficulty expressing their problems verbally, or those with a language barrier, will also be more encouraged to share during a live chat conversation. And what about those problems your support agent heard on a call but didn’t tell anyone about?That problem is solved, too. Most, if not all, live chat applications keep an archive of all chat. This allows management, QA, or trainers to review chat logs to discover problems, complaints, or areas for improvement. There are many ways live chat can speed up problem resolution for your customers. Most of them have to do with convenience. Have you ever called tech support and spent a long time on hold waiting to ask one simple question? Imagine how easy it would’ve been to instantly send support your question knowing the message would be received and responded to in a matter of minutes (if not seconds)! 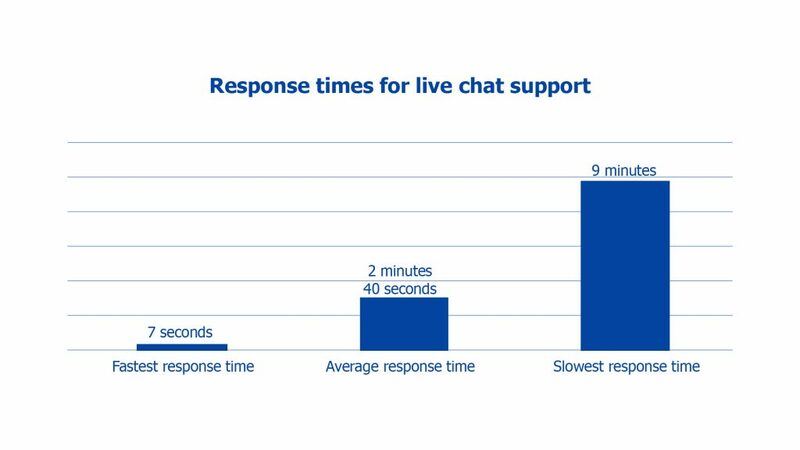 Take a look at the average response time for chat below, and you’ll quickly see why customers prefer to use chat. Attaching files or sending links is another great benefit of live chat. Rather than trying to spell out a URL over the phone or promising to email a document, your support agent can simply send the file or link through their chat conversation. We’ve touched on this a few times already in this article, but it’s important and worth mentioning several times. Your customer’s convenience is a big deal. In fact, customers who had a bad experience on a website are 88% less likely to return. That’s almost a guarantee they’ll never visit that website again! Of course, a bad online experience could be caused by a lot of different things. But one of the biggest complaints is the inability to find a simple and fast way to contact the company. 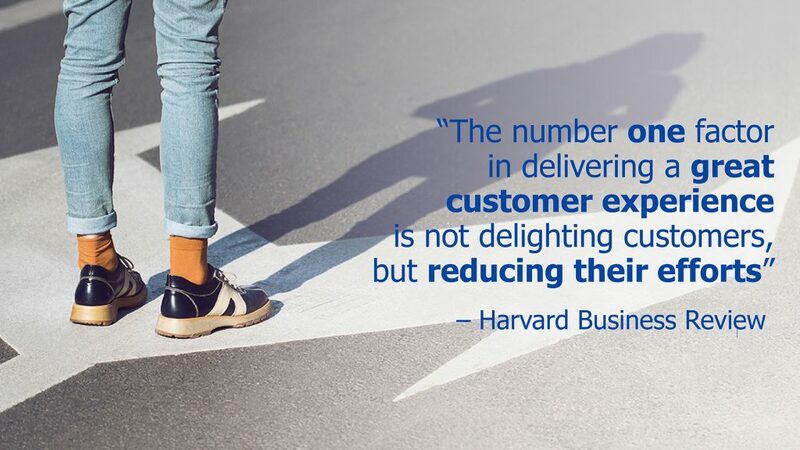 Once they’re in contact, your customers still expect convenience and ease. This is where the points mentioned above, like response time and sending documents, can really make your customer’s life easier. If you want to foster a feeling of loyalty, make your customers’ interactions as painless as possible. We saw some statistics earlier about live chat usage. While those numbers were impressive, we’re really only getting part of the story. 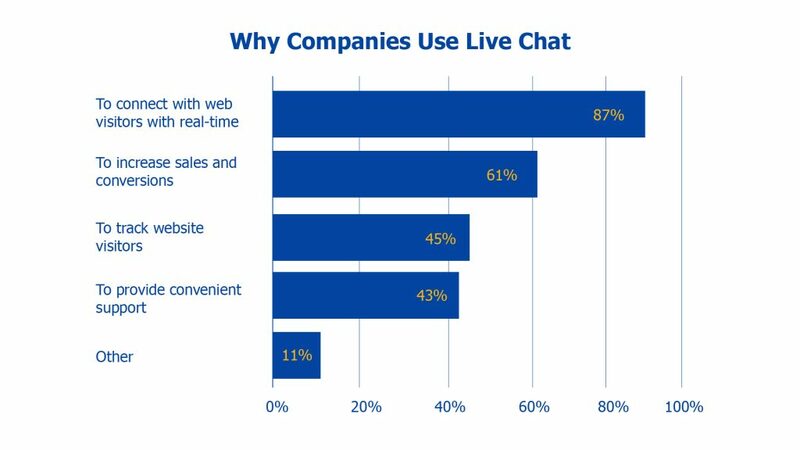 The stats tell us customers like live chat and they want to see it available on every site they visit, but the stats don’t tell us this… A lot of companies are still not using live chat! A study of 1,000 businesses found that only 9% had websites with a chat function. This is surprising, given the vast amounts of data proving customers prefer live chat. Imagine the success of the 9% who are using live chat. It’s a smart, cost-effective, trouble-free way to get a leg up on your competitors. Simply having a website does not guarantee your business an online presence. A website is a lot like a storefront. Only your storefront doesn’t have any windows, and people on the street can’t see anyone inside. This makes it impersonal and maybe even a little bit sketchy. It’s hard to get new customers that way. But if you put some windows in your storefront, turned on some lights, and staffed it with people, things start to change. Now customers on the street know there are people available to help them. It’s no longer a gamble to go inside and shop. In reality, your website is a domain and a bunch of code. But it doesn’t have to be so cold. With live chat you can turn your website into the neighborhood store even if your customer is across the globe. We know live chat allows your customers to reach you in real time, but there’s another side to that coin. Most live chat applications also allow your support agents to reach out to website visitors. This usually happens with pre-defined rules set up in the chat application. One of the most common rules involves visitors who have browsed on a page for a certain amount of time. They’ll see a chat prompt inviting them to ask any questions they may have. This type of proactive contact is another way visitors feel welcome on your website and comfortable with your brand. Reaching out to offer assistance can be the difference between a browsing customer and a buying customer. Phone reports are helpful, but they’re really just numbers. Email reports are less helpful, and they’re also just full of numbers. Live chat applications provide a variety of reports and analytics. These can range from standard reports like chat volume and agent performance to more specialized reports like geolocation. The reporting capabilities are generally more robust than phone or email reports and can help organizations get a holistic view of their customer. Most live chat applications include built-in customer surveys. The surveys, often presented immediately following a chat, tend to have a high rate of response because the customer is already engaged. 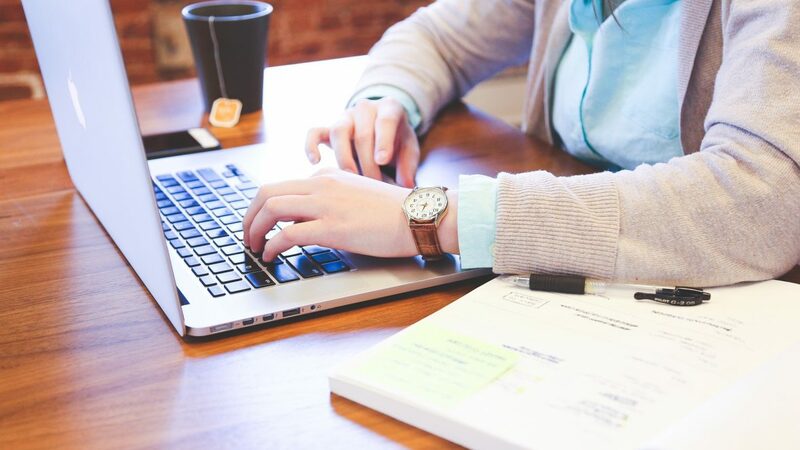 Customer feedback is helpful in any case, but live chat surveys are particularly valuable because the data is easily reported and analyzed through the live chat application. What do I need to implement live chat? These days, most live chat applications are cloud-based and hosted by the chat company. In this case your organization’s server plays little role, and no specific requirements are needed. If you choose to utilize an application that’s installed directly on your server, your requirements will vary depending on the solution you choose. Check with the vendor in this case. Fortunately, if your customer has internet access they can most likely make use of your chat tool as all popular operating systems are supported. An updated browser usually provides the best experience. This goes for mobile customers as well. The most popular mobile browsers can interact with live chat applications. Similar to the requirements for visitors, agents also need an updated browser to view and interact with chat customers. For agents handling chats from a mobile device, ensure the device is using the most updated mobile browser for their operating system. If you choose to take advantage of the audio and video capabilities offered by many chat applications, the system requirements are largely the same as above. All popular operating systems are supported. However, older browsers may have some issues with this type of chat (especially video), so it’s important that both the visitor and agent are using the most updated version of their browser. It would be great if the mere act of installing live chat sent your sales and customer satisfaction through the roof. Installing is just the first step, however. The second step requires a little work from you. Here’s how you can make the best use of your chat application. One of the benefits of live chat is the agent’s ability to process several chats at once and answer simple questions with ease. Canned messages are one of the reasons this is possible. Canned messages are a huge timesaver, but be careful when and how often they’re used. These responses can seem impersonal (they are, after all). Word your canned responses in a way that doesn’t seem like they’re computer generated. Use them when appropriate, but certainly don’t carry on an entire chat conversation using only canned responses. The personal touch – knowing they’re chatting with a human – is what makes your customers love chat in the first place. Check out live chat examples from others in your industry if you’re not sure where to start with canned messages. The rapid-fire nature of live chat is what draws a lot of customers. If they call your office, they’ll probably be put on hold. If they send an email, they’ll have to wait at least a day for response. But if they engage you in live chat, they’re expecting almost instantaneous attention. The general rule for response time is about 30-seconds. This means the initial chat request and each subsequent message should be handled within 30-seconds. In some organizations, the bar is set even higher, with agents expected to respond within 10-seconds or less. It’s important to keep your customer’s attention – especially if the customer is pre-sale. Dragging out a chat with long pauses between responses will only cause the customer to lose interest. Your website should plainly state your company’s business hours, especially if you’re not open 24/7. Same goes for your chat application. Likewise, if your chat agents aren’t available at any point during your business hours, make sure it’s obvious. Make use of your chat application’s scheduling and availability functions. When your business closes, make it clear chat is closed and will re-open later. If all agents are busy during business hours, be sure your chat button reflects this – tell your customer no one is available or invite them to leave a message. When you’re chatting online, a simple name and photo can do wonders. Attaching a name and face to the person typing is the first step in building rapport. Make your agents more accessible by adding their photo and name to their chat profile. Your customer will feel they’re corresponding with a person instead of a bot. Train your chat agents to reflect your brand in their chat interactions. At the same time, be sure your agents are connecting with customers on a personal level. If you’re a medical supply company, there’s a good chance your customers are familiar with the technical terms of the industry. In this case, it’s okay to use those terms and other jargon. On the other hand, if you’re a plumbing company, it’s likely your customer is a homeowner. They’re probably not familiar with the technical terms a plumber might use. In this case, the chat agent should use language a homeowner is comfortable with and avoid terms or concepts only a plumber would understand. Look to your competitors for customer service chat examples if you need guidance on how to best interact with your customers. Live chat is a less formal way of communicating, but it shouldn’t be unprofessional. Be sure your agents are using correct grammar, spelling, and punctuation (even if the customer doesn’t). Make use of any spell check tools available with your chat application. If there’s a particularly difficult statement or phrase that your agents are always using, set up a canned response. With the popularity of live chat growing every day, there’s no shortage of applications you can use. When you’re shopping for a chat solution, keep your organization’s specific needs in mind. What works for your competitor may not work for you. While you’re shopping, be sure to check out Nextiva Chat. 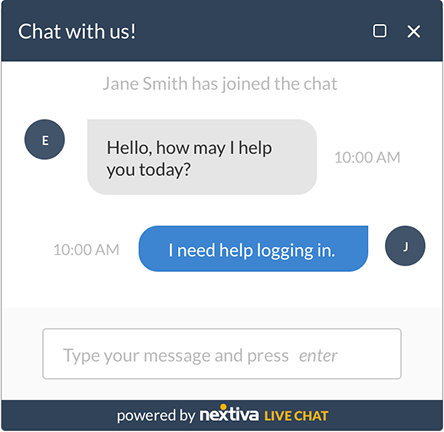 Packed full of features, Nextiva Chat will transform the way you interact with your customers. Check out some of Nextiva Chat’s popular features. All these features come along with Nextiva’s Amazing Service. Learn more about how our team of real people work to get real results for our customers. Amazing Service is not just a catch phrase, it’s how we live.